This collection is part of Main Street Rag’s Editor’s Choice Chapbook Series. 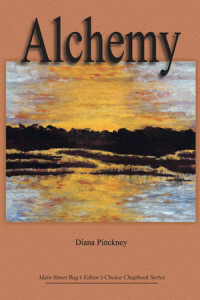 Diana Pinckney has published poetry and prose in such journals and magazines as Cream City Review, Tar River Poetry, The Deep South Writers Chapbook, Gulf Stream, The Comstock Review and others. Her chapbook, Fishing With Tall Women, won North Carolina’s Persephone Press Book Award and South Carolina’s Kinloch Rivers Memorial Chapbook Contest. Nightshade Press published her second collection, White Linen. Two of her poems have been nominated for a Pushcart Prize. Pinckney was selected for North Carolina Writers Network’s Blumenthal Writers and Readers series in 1994 and 1999. 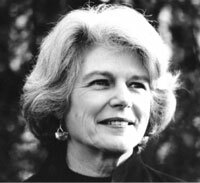 Her writing has won awards from numerous journals and from the North Carolina Poetry Society, the Poetry Council of North Carolina and the Charlotte Writers Club. Her work has been published in the following anthologies: Trapping Time Between the Branches: An Anthology of Charlotte Poets, (Public Library of Charlotte and Mecklenburg County), Word and Witness: 100 Years of North Carolina Poetry (Carolina Academic Press), Earth and Soul: an anthology of North Carolina Poetry published in Russia (Kostroma Press) and Hungry for Home: Stories of Food from across the Carolinas (Novello Press). Pinckney writes book reviews for Creative Loafing Magazine and teaches poetry writing in the Continuing Education Department at Queens University of Charlotte. She grew up in Columbia, S.C. and attended the University of South Carolina. She and her husband, Francis, have lived in Charlotte for many years where they raised three children and now have three grandchildren. a marriage, counting years with sand and salt. the year the furnace burned out. circling us like a happy family. the weather in that house. my legs shivered and jerked. was my own body burning like a motor. where candles licked the windows. all the faces wet as mine. with a fire that rippled in every direction.